You are here: 4Who does What? This section focus on the organizations and individuals, who are involved in research into Danish Naval History. The main emphasis is of course that part of the research relating to the history of the Royal Danish Navy and the Royal Danish-Norwegian Navy (until 1814). It must be stressed, however, that only a little material of the Danish Naval History is available in English or other languages; most are only available in Danish. On this site you can find a survey of the research projects and researchers into Danish Naval History; and which are known to this website. The goal of this survey is to give you an idea, on which specific research topics, presently being researched, and on some occasions the scheduled publication of the results. This might encourage other organizations or individuals to support these projects by supplying any additional information they know of, on the topics mentioned. In this way present researchers might obtain information, not known or unknown sources. Secondly it might prevent researchers from dual work. One of the organizations organizing the researchers of Danish Maritime History is the Committee for Danish Maritime History and Anthropology, in Danish: "Kontaktudvalget for Dansk Maritim Historie- og Samfundsforskning". This committee is at the same time the National Commission of the International Commission for Maritime History. Every second year, the Committee arranges a conference, where several maritime topics are presented and debated. The conferences are always held at different Danish locations, related to the maritime history. At least once a year, the Committee publish a book covering either one in-depth topic or a number of various topics. The publication is named MARITIM KONTAKT, and the first publication was published back in 1980. The registered members of the Committee receive this Publication as part of their membership. The books are also available to none-members and can be ordered either through the Committee or the Royal Danish Naval Museum. The Royal Danish Naval Museum is Denmark's official Naval Museum, and it houses some of the most extraordinary collections on Danish Naval History. These collections includes a unique collection of ship models, models of ornamentation and of machines and devices, produced and used at the naval dockyard or at the Navy's instal-lations in Copenhagen through the last 300 years. You can also meet the modern Navy at the exhibition by entering the command platform of a built-up of the Guided Missile Patrol Boat of the WILLEMOES Class. The museum and its staff also participate ac-tive into the Danish Naval History research, and is publishing the "MARINEHISTORISKE SKRIFTER". A survey of the MARINEHISTORISKE SKRIFTER can be found and ordered at the museum's website. Additionally the museum's archives house a huge collection of photographs, covering a number of events and almost all ships serving the Royal Danish Navy. Quite a number of the photos on this website is made available by courtesy of the Royal Danish Naval Museum. You can order copies by e-mailing the museum. In Danish it's called "Marinehistorisk Selskab" and "Orlogsmuseets Venner". The main purpose of this society is to encourage the general interest into the Danish Naval History. This is primarily done by arranging lectures and excursions etc. related to Naval Historical topics. At the same time, the Society is productive in the enlargement and improvement of the museum's collections; and supporting ongoing specific research projects initiated by the Royal Danish Naval Museum. 4 times a year (quarterly), the Society publish a Naval Historical Journal, the "MARINEHISTORISK TIDSSKRIFT". This Journal is posted to all mem-bers of the Society. Besides receiving this Journal, all members of the Society gain free entrance to the Royal Danish Navy Museum, the Viking Ship Museum in Roskilde and the Danish Maritime Museum at Kronborg Castle, Elsinore. The Naval Journal, or in Danish "Tidsskrift for Søvæsen" is the oldest an most esteemed journal covering Danish Naval History, and most probably one of the oldest of the kind in the world to day. Søe-Lieutenant-Selskabet, or the Society of Navy Lieutenants, founded September 17, 1784, is responsible for the publication of this journal. This journal covers a number of in-depth navy military topics, just like revealing several naval military aspects. Tidsskrift for Søvæsen is published quarterly and is now in its 177st volume. Subscriptions can be made via the Søe-Lieutenant-Selskab in Copenhagen. If your prime interest is genealogy none of the above, nor this website, can give you much assistance. 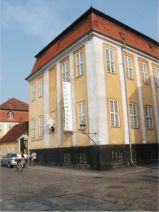 All former Danish military records are held at "Rigsarkivet", the Public Records Office, in Copenhagen. These files are open to the public most weekdays, but you should not expect to solve any family tree on line. This section will also try to keep you updated on newly published books etc. concerning Danish Naval History. You will also occasionally be presented to Book Reviews on some of these publications.